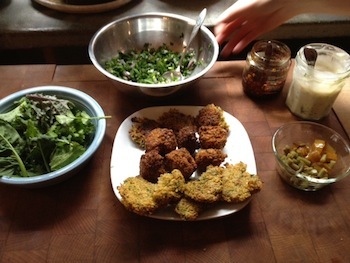 Falafel: the jewel of Mideastern street fare, doable in your own home. A few days ago, I wrote about how I’m all in favor of of helping people figure out ways to eat less meat, but skeptical that industrial fake-meat products based on soy-protein isolates are the way to do it. I posited that whole-food dishes like falafel—chickpeas ground up with spices and then deep-fried—might be a better beacon toward a less meat-intensive future. Writing about falafel gave me a powerful craving for it. And where I live in rural North Carolina, there are no falafel joints. So if I knew that if I wanted to have some, I’d have to do something I’ve never done before: make falafel at home. And that give me the opportunity to see whether falafel has a place in a practical-minded, no-time-for-fuss kitchen like mine. 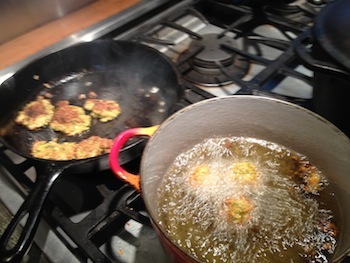 Pan fry, deep fry: it’s all good.The first thing I needed was a recipe, and I knew what to do: I merely typed “Bittman + falafel” into Google. Mark Bittman—whose provocative column on meat substitutes started me on my falafel journey—is the heavyweight champ of straight-ahead, minimalist cooking. I found this recipe from a 2008 New York Times column of his. Now, my main reservation about home falafel has always centered on the fact that it’s deep-fried. I love deep-fried foods as much as the next person, but I rarely use the technique at home because it requires so much oil and makes the house smell like a grease trap (unless you have a good vent). So I decided to give the traditional cooking method a shot under Bittman’s tutelage, but also to experiment with two other techniques for cooking bean paste: pan-frying, which is basically sautéing with just enough oil to cover the bottom of a pan; and baking. Having never made falafel before, I was surprised that you don’t pre-cook the chickpeas before they’re ground. You simply soak give them a 24-hour soak, drain them (reserving some of the soaking water), and drop them in a food processor with a few other ingredients: onion, garlic, parsley, paprika, ground cumin, ground coriander, a little lemon juice, and salt and pepper. Then you pulse the mixture, using as little of the reserved water as possible, until it forms a kind of rough paste. I found that the whole thing came together quickly, with only a splash of water. With very little fuss, I suddenly had a whole bowlful of batter that looked fit for a real falafel joint—minimalist, indeed. Following Bittman’s orders, I tasted the batter for seasoning, decided to ramp up the coriander, cumin, paprika, and salt, and gave the batter a few more pulses. Bittman even delivered a tip that made deep-frying way easier than I had foreseen: Use a small pan. When I think of deep-frying, I think of chicken pieces sizzling in a huge skillet, a process that requires monstrous amounts of oil. But with a small pan, you get away with using much less oil; and falafel balls—which Bittman says should take just a heaping tablespoon of batter—are small enough that you can do several at a time even in a modestly sized vessel. So I gave my sauce pan about 2.5 inches of oil (a little more than a pint) and brought it to 350 degrees, using a thermometer to measure. I dropped in a few falafel balls and held my breath, half-expecting them to explode into greasy mush. But they stayed whole, and soon transformed into gorgeous, deep-brown falafel orbs. And all for about 10 minutes of active cooking time. Meanwhile, I improvised pan-fry and baking techniques. For the pan-fried ones, I heated a cast-iron skillet over medium heat and added enough oil to cover the bottom. I used the same amount of batter I had used for the ball, but tamped them down into little patties to maximize contact with the hot pan—an attempt both to speed cooking and encourage browning. For the baked ones, I preheated the oven to 400 degrees and spread some parchment paper over a small baking sheet, lightly greasing it with oil. I baked the flattened patties for 10 minutes or so, then flipped them and gave them five or so minutes more. For me, the deep-fried balls were best: a nice crunch, and then moist deliciousness inside. And they weren’t greasy at all. But the pan-fried and bake versions were worthy, too. They had much less crunch than, but delivered all of the flavor of, the fried ones. And my roommate actually preferred them. She found the fried ones too crunchy; and thought the texture inside both the baked and pan-fried ones more to her liking. Who needs meat?Of course, making falafel doesn’t just entail making falafel—you also need pita bread and garnishes. In many places in the US, you can buy decent pita at a middle eastern shop or good grocery store. Not so much here, so we made ours using a simple recipe calling for a yeast dough, which we rolled out and cooked just before eating. For garnishes, we kept it simple. We took Bittman’s advice on a sauce: “mix equal amounts of tahini and yogurt, and season to taste with a little salt, pepper, cumin, raw garlic if you like, and lemon juice” (though we subbed cider vinegar for lemon juice, since we had no lemons on hand). And I made a quick salad of a handful of chopped parsley mixed with a bit of chopped red onion, dressed lightly with olive oil and cider vinegar. We also had mixed salad greens from the farm, homemade salsa macha (a diabolically hot puree of dried chile peppers and olive oil), and some chopped-up pickled cucumbers and green beans. The result was a fantastic and easy meal. I may have have just taken the first step down a slippery slope that will end with me shutting my laptop and opening a falafel stand. (Just kidding—I think.) I advise all omnivores looking for satisfying ways to cut down on meat to give it a try. UPDATE: So, Bittman’s recipe, which calls for 1 3/4 cups of chickpeas, make a lot of batter. I found its sheer volume overwhelming, at first, because my household right now consists just of two people. But I mixed it on Thursday and it’s now Saturday—and it’s still cooking up great. I just saved the original oil and reheat it when I want to fry off a few nuggets. My kitchen has become a falafel stand. Dreams come true.